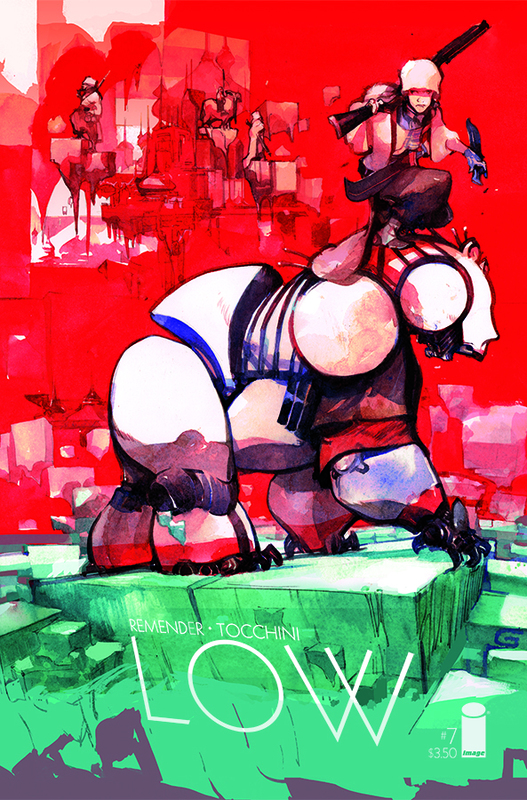 The cover of Low #7, in which a robot polar bear is ridden and Rick Remender flirts with literary greatness. I have been a sharp critic of Low, but I keep buying it because Greg Tocchini’s colors skate down all the reward pathways of my brain. Low #8 came out recently and I bought it too—but I haven’t even read it yet because I am still stuck on the beauty of Low #7. It’s a gem of a short story, and a true stand-alone issue: complete, self-contained, and able to justify its own existence. Other stand-alones between arcs shouldn’t even be called “stand-alones.” They should just be called “confusing interludes,” and then everyone would know what to expect. Low #7 on the other hand, is the clearest and best issue of the series thus far, with fewer characters, less noise, and more digestible sincerity. It might also be the best thing I’ve ever seen from Rick Remender, period—he builds strong story bones and then stays out of his own way in Low #7. Tocchini adds strong action, expression, and color—but he holds himself back from accidentally turbo-powering Remender’s latent cheeseball factor. The story shows us one day in the life of two people: A high-ranking government official and her artist girlfriend. We don’t need to get to know anyone else. The story has only two locations: home in the morning, at work during the day, and home in the evening. There’s no narration, no thought boxes, no backstory pressed into dialogue. There are no flashbacks, no fancy cutting or jumping. World-building is kept to a minimum. All we need to know is that these two people love each other, and art is considered dangerous and illegal in this city-state. It’s a utilitarian world we haven’t seen before—so the interiors are calm in the scenes with the women, and our eyes are held by their faces. Tocchini fills the panels with rusty reds, sea greens and whites, but makes the artist’s hair and garment a bright blue that tilts at a strange angle from the rest of the palette. It feels like a quarter tone of music, caught between notes, just a little jarring. It adds to our sense that she vibrates at a different frequency than both her lover and the rest of the city-state. The sexual tension between the women is palpable, but so is their everyday discontent with their lives and each other. It makes their love believable. The themes of artistic freedom and a totalitarian state are classic and played the usual way. In this case the newness is all in Tocchini’s wonderful details and in Remender’s one hundred little decisions to hold back and not hammer on the story’s big ideas. Instead he focuses on the feelings of the two women, keeping everything on a human level and forcing lofty themes through that lens. The story moves organically, moment to moment, glance to glance, taking its time. In the middle pages, when the government official is terrorizing an underground printing press, the panels get more frenetic and busy with scuffles and bodies. Tocchini keeps these panels earthbound and physical as the scene deteriorates into a brawl. The panels narrow and shrink and then dash off the edge of the page, deepening the effect of a scuffle in dim rooms with low ceilings. He manages to give us the impression of a fight at the same time that he blocks the fight out for us like dance steps. By the time we get to the story’s climax and last big struggle, everything… is … gut-wrenching. It is gut-wrenching in exactly the way Remender tries and fails to make things gut-wrenching in so much else that he does! Rick Remender, stop and notice what you did and how you did it in Low #7. Here you made us feel, just what you wanted us to feel. And we feel it hard.